His Building Blocks: Did you notice something different--we have a cast-free, splint free Luke! Did you notice something different--we have a cast-free, splint free Luke! Well, almost. Luke had a follow-up visit with the Orthopedic physician on Thursday, 3/10, to review the healing process on his radius/ulnar shaft reduction. 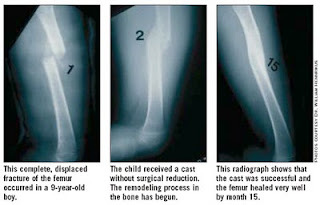 New X-Ray images were taken, which revealed his ulna and radius had a LOT of new bone formation. In fact, around where the breaks were located following the reduction procedure, his bones were triple the normal thickness. You could still, however, see the fracture within this new bone on the old bone. But, it was amazing that it had new bone on each side of the old, acting as a protective armor. The doctor removed the splint and told us his bones would continue healing, and in 6 months if we were to get new X-Rays, we wouldn't be able to tell he ever broke a bone! 1. We showed up at the hospital with a bent arm after climbing onto and falling off of a chair. 2. Here is an example of a femur shaft fracture remodeling without any intervention besides casting. That was of a 9-year old child. With Luke being much younger (bones even more porous and immature) the healing process should occur even more quickly. And about those triple thick bones--I asked the doctor if his bone would go back down to normal size. He said that the bone should become completely normal after the fracture completely heals. How amazing is it that the bones get thicker around the break as the fracture heals and then dissipate when no longer needed? Because we were nervous walking out of the doctor's office with no protection around Luke's arm, the doctor made us a temporary splint out of fiberglass that we can put on Luke when he is being extra rambunctious. I told the doctor that he would probably be wearing it anytime he is awake if we are using "being rambunctious" as the guidelines for when to wear it. He laughed but said after two weeks of that, we should not use any type of extra protection. Little Luke has been such a trooper during this whole thing. He doesn't even fight putting the temporary splint on. Actually, when he sees me bringing it over to him, he sits downs and stick his arm out for me to place it on. We love our little guy more than words can ever describe, and are SO EXTREMELY excited he is almost completely healed.